B.J. Kim is a founding partner of Kim & Bae, PC. Mr. Kim’s areas of expertise include sophisticated corporate and commercial litigation, domestic and international commercial transactions, real estate, contracts, acquisitions, commercial collections and complex litigation involving fraud, contract and defamation matters. Mr. Kim also has wide experience in business law, corporate dispute resolutions, licensing, insurance and international claims matters, and has represented US subsidiaries of major Korean companies. 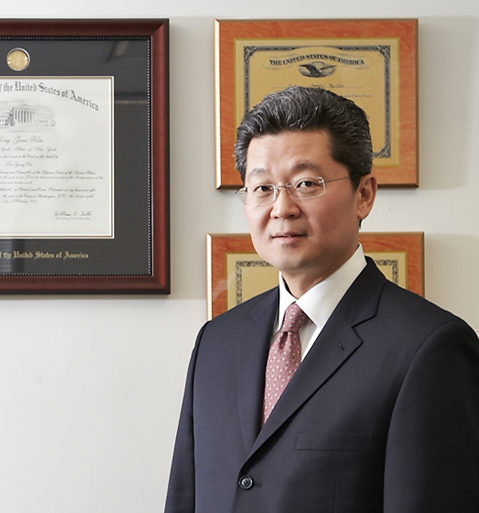 Mr. Kim has also represented and litigated against various major corporations including Bank of China, Benjamin Moore & Co., Panasia Bank, Woori Bank, Hyundai Securities America, Tribune Company of Warner Brothers Entertainment, Lockheed Martin and Growell Corporation in both state and federal Courts. Prior to Kim & Bae, Mr. Kim was the founder of Kim & Associates, P.C. Mr. Kim also was associated with Monaghan, Monaghan, Lamb & Marchisio of Hackensack, New Jersey. Some of Mr. Kim’s cases have been widely covered by the New York Times and New York Newsday, as well as various Korean media, including, the Korea Central Daily News, the Korea Times, KBS, MBC, and local TV and radio stations. Mr. Kim is a member of the Bars of the States of New York and New Jersey, and is admitted to practice before the U.S. Supreme Court, the U.S. District Courts for the Southern District of New York, the U.S. District Court for the Eastern District of New York and the U.S. District Court for the District of New Jersey. He is fluent in Korean and conversant in Cantonese. Mr. Kim received a B.B.A. from University of Michigan, School of Business-Ann Arbor and J.D. from Syracuse College of Law.